Stretching 750 miles across eight countries (France, Switzerland, Italy, Monaco, Liechtenstein, Austria, Germany, and Slovenia), the Alps is the highest and most extensive mountain range in Europe, famed for its world-class ski resorts, epic hiking trails, challenging cycle routes, and - of course - incredible mountain roads. 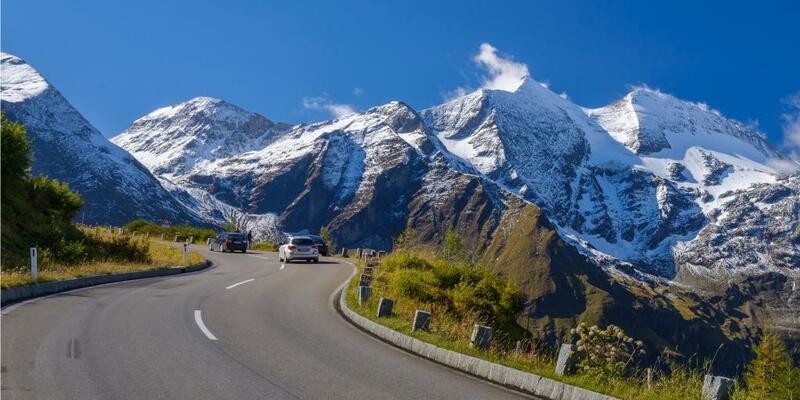 When it comes to driving in the Alps, you're pretty much guaranteed to be met by adrenaline-inducing hairpin turns, steep inclines and picture-perfect views whichever country you choose to visit, making for some of the best driving opportunities in Europe. Most Alpine roads are closed in the winter for safety reasons, so if you're planning to drive through the Alps, you're better off picking a date in the late spring and summer. You can save the snowy peaks for ski season and use this road trip to admire the fresh Alpine meadows, wild flowers, cascading waterfalls, and rocky peaks that come alive in the warmer months. So what's the best way to cross the Alps by car? Here are our top ten picks, from meandering mountain passes to epic longer routes, each of which highlights the unique diversity and beauty of the Alpine region. 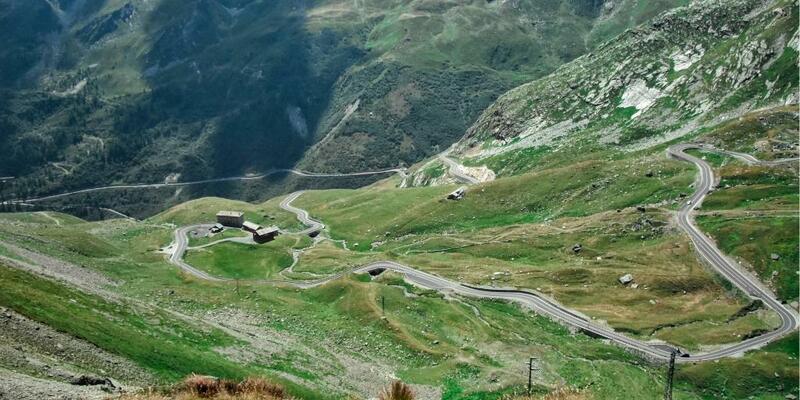 The Great St Bernard Pass is one of the most famous drives through the Alps. At an elevation of 2,469 metres above sea level, the pass lies on a ridge between the two highest mountains in the Alps, Monte Blanc and Monte Rosa, and is made up of exciting twists and turns with incredible views around every corner. The road stretches from Martigny in Switzerland to Aosta in Italy and was historically used as an easy way to cross the Alps (there's evidence of a Roman road here) and as a trade route. Since the opening of the Great St Bernard Tunnel through the mountains, however, its practical use has decreased and it's become almost exclusively a fun and enjoyable road to drive, attracting thousands of tourists each year. Another factor that draws in visitors is the historic Great St Bernard Hospice. Located at the highest point of the pass, the hospice is thought to have been founded in the 10th century to house weary travellers on their way across the Alps. The hospice was also made famous as the site where St Bernard dogs were bred to work as rescue dogs, able to cross deep snow and track down lost travellers. Although the dogs are no longer bred here, the hospice still welcomes passing guests, and houses a really nice restaurant, informative museum, and souvenir shop if you fancy a break. Take your time winding along the pass, and stop regularly to take in the views - trust us, the driver will want plenty of opportunities to take their eyes off the road during this trip! Grossglockner is not only Austria's highest peak, but one of the highest in the Alps, so a drive up the Grossglockner High Alpine Road is guaranteed to be impressive. 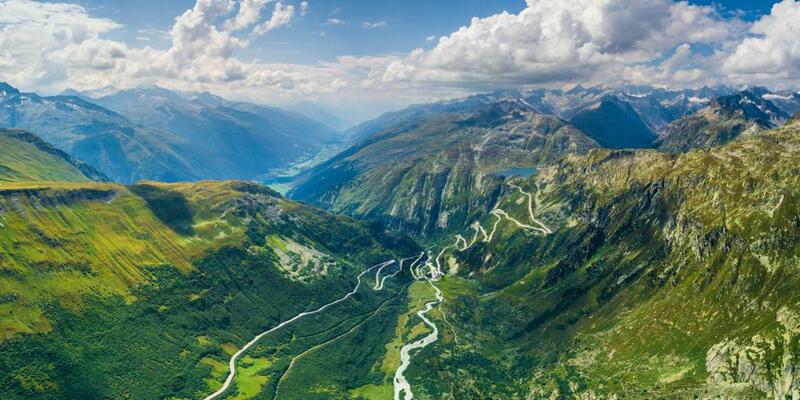 This epic Alpine road runs through the heart of the Hohe Tauern National Park and up towards the peak of the mountain, wriggling through meadows blanketed in wild flowers, fragrant forests, and rugged crags. Be sure to drive up to the Kaiser-Franz Josephs Höhe, a scenic spot offering spectacular views of the longest glacier in the Eastern Alps, the Pasterze. There's an informative Visitor Centre here where you can learn all about the glacial landscapes. It's also possible to park up here and go for a scenic walk or picnic if you want to, but make sure you've packed some warm clothes as you'll be at an elevation of 2,369 metres and there's likely to be a strong wind chill. Note that the road isn't open 24/7, and there is a fee to drive along it. From 1st June to 31st August the road is open from 5am to 9.30pm, from 1st September until 26th October it is open from 6am to 7.30pm, and from November to May the road is closed. A day ticket costs €36.50 per car and is payable online in advance or at one of the toll booths. 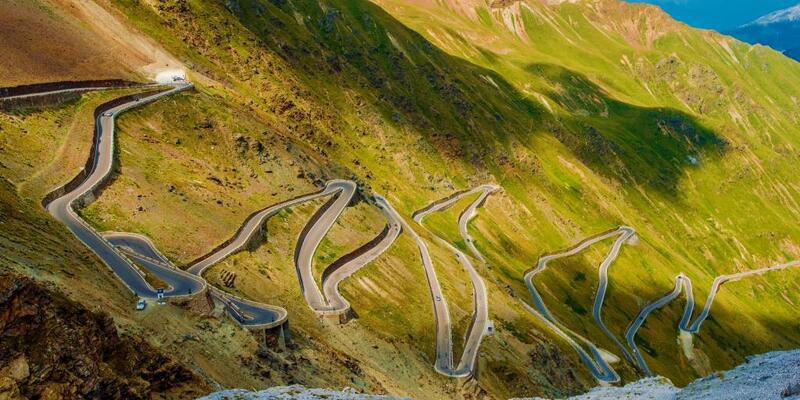 The Col de la Bonette is widely considered one of the most epic Alpine passes in France, and for good reason. Stretching from Saint-Étienne-de-Tinée to Jausiers, this route was made famous as a leg of the Tour de France in 1962, 1964, 1993, and 2008, meaning it attracts just as many cyclists as it does driving enthusiasts. Thanks to its involvement in the Tour de France, it's a pretty smooth tarmac road that's relatively easy to drive on, but be aware it can get pretty narrow the higher you climb. Take in the incredible views of the snow-capped mountains as you cruise along, and make sure you drive the scenic loop around the Cime de la Bonette (aka the summit), park the car at the top, and walk the remaining few metres to the peak for the best views across the mountains. 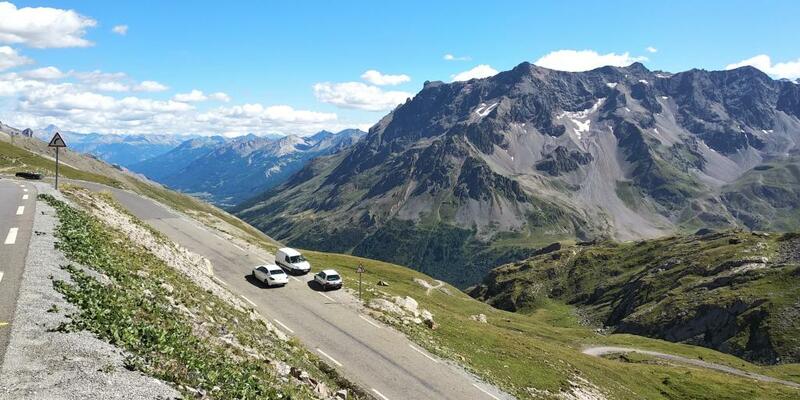 This mini summit road is, however, a source of controversy because it climbs an extra 87 metres higher than the actual Col de la Bonette pass, leading false claims to be made that the Col de la Bonette is the 'highest road in Europe'. This is a pretty crazy claim that you'll find signposted as you drive, but don't believe the hype as there are a handful of other roads that rise even higher. The obvious leader is the Veleta road in Spain's Sierra Nevada, which - at 3,392 metres high - easily surpasses Col de la Bonette's 2,715 metres. And if you want to stick to the highest mountain passes, then both the Col de l'Iseran and Stelvio passes in the Alps also rise higher. Regardless of the technicalities, one thing everyone can agree on is that ascending these two roads offers some truly fantastic views; plus the backstory makes for a great car debate! Used as a location for the Bond film Goldfinger, the Furka Pass in Switzerland gives you the chance to channel your inner spy (probably minus the Aston Martin and car chase) as you glide around its hairpin turns. Another big climber reaching 2,431 metres, you won't be short of good views on this route through the Alps, especially when the beautiful steam train chugs through the mountains alongside you. The usual advice of stopping to appreciate the views obviously applies to this road, as well as a pit stop at the Rhone Glacier where you can walk inside the eerie blue light of an ice grotto. But be warned: the ice melts steadily over the summer, so it's best to visit sooner rather than later to get the full effect. Have a playlist of the most epic Bond theme songs at the ready to make the scenery seem all the more dramatic, and take your time driving through - the hour and a half drive can easily fill a whole afternoon. The German Alpine Road is the longest route on our list, and is a lovely scenic road that covers the very best of Germany's Bavarian region..
Stretching from Lindau on Lake Constance in the west all the way to Schönau on Lake Königssee in the east, this road is a pleasure to drive as it winds through breathtaking valleys and past magnificent mountain peaks. 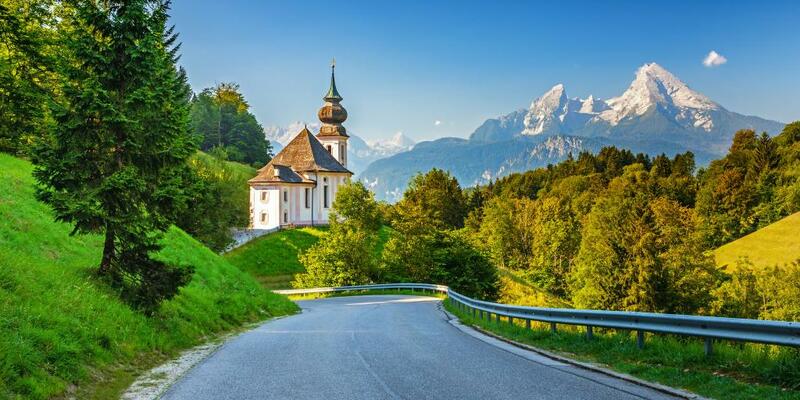 Of all the roads we're suggesting, this is the one where you'll get to see the most towns and cultural sights in addition to the drive, including fairy tale Neuschwanstein and Hohenschwangau castles and picturesque Bavarian towns such as Füssen and Garmisch-Partenkirchen. Due to the length of the drive, the scenery you'll pass by is super mixed, ranging from lush meadows, to rolling hills, dramatic peaks, and glittering lakes. A few highlights to note include crossing the Oberjoch Pass, driving through Upper Bavaria, and enjoying the lush Bavarian landscapes of the Chiemgau region. The vast number of different areas you'll pass through during this drive make the route a little more varied than the popular Romantic Road, and means there's loads to do as well as see along the way. You'll have the opportunity to take a dip in an Alpine lake, walk a high-wire, browse museums, and stroll around villages, making a drive along the German Alpine Road more of a holiday than a quick trip in the car. Time it takes to drive: 8 hours (without stops), but we'd recommend taking a 4 to 7 day road trip to make sure you don't miss anything. When to go: Spring or summer to avoid the snow. Some sections of the road may be closed in winter due to dangerous weather conditions. If you do choose to visit in the colder months, prepare yourself by reading our safety tips for driving in Europe in winter. From above, the Stelvio Pass looks like a piece of string draped across a mountain, with its 48 hairpin bends promising an exhilarating (and pretty challenging) drive. With less scenic sights than some of the other routes (the spectacular views are mainly found at the summit), this road is all about the drive, with hair-raising 180-degree turns, steep drops, and tight tunnels ensuring that those who tackle the pass get the ultimate adrenaline rush. The road doesn't need any more of an introduction, just be aware that passing other vehicles and navigating the twists and turns can be really challenging, and note that once you've set off it's difficult to turn back, so make sure you're confident before you hit the road! For more tips about road rules, tolls and car etiquette, you can read our guide to driving in Italy. Driving south from Zurich, the Klausen Pass is one of the first major mountain passes you get to, transporting you straight from the city into the heart of the Swiss Alps in around an hour. 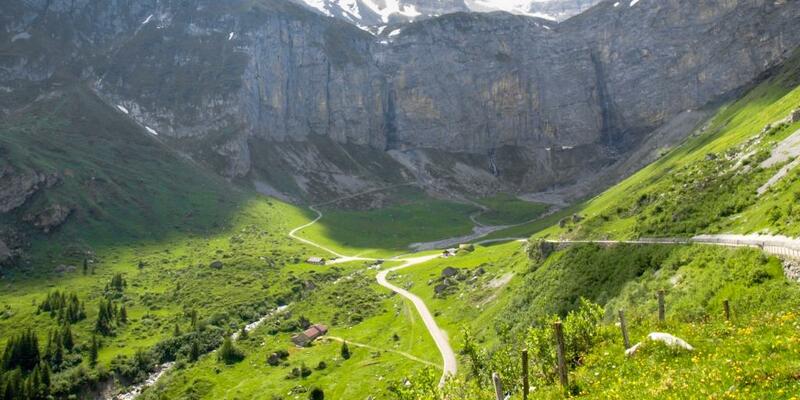 If you're going on a Zurich city break, driving the Klausen Pass is a great way to spend an afternoon getting to grips with Switzerland's stunning natural beauty, and to escape the bustle of the city for a few hours. This area is also one of the best places in Europe to spot the leaves changing during the autumn season, so keep an eye out if you're travelling then. With the slightly more modest altitude of 1,948 metres and fewer sharp hairpin turns than some of our other Alpine drives, this road is a great option for those looking for a more relaxing, but no less spectacular, experience. The pass extends from Altdorf to Linthal, and offers panoramic mountain views all the way to the summit. One of the major highlights of the route is the five-kilometre Alpine plateau, Urnerboden, where the road straightens and flattens, giving you ample time to take in some of the most spectacular granite peaks in the Alps. Also look out for numerous waterfalls as you drive through, and stop for a coffee at the Klausen Cafe at the top of the pass to take a break and breathe in the fresh Alpine air. Epic Nockalm Road road runs through the UNESCO-protected Nockberge Biosphere Reserve, an area that serves to celebrate the stunning flora and fauna found in Austria's Carinthian Mountains. This protected status means that you won't find any busy ski resorts here, allowing visitors to enjoy miles of uninterrupted idyllic Alpine scenery, so triple-check you've packed your camera before hitting the Nockalm road. As expected on any drive through the Alps, the mountain views are incredible from this road, as well as being uniquely characterised by dome-like grassy summits called 'nocken'. Keep an eye open for these as you drive through. The Nockalm Road is also a great option if you're travelling with restless kids or want your trip to be more than just a scenic drive, as it has a whole host of great attractions to visit aimed at educating visitors on the natural biodiversity, culture and sustainability of the area. A few of our favourite stop-offs include the Nockalmhof Biosphere Reserve Centre, which contains loads of interesting interactive exhibitions on the area's habitats, the 'Silva Magica' natural adventure park, and the Zechneralm Meadow Farming Museum, where you can learn all about the agricultural produce of the region. There are also a number of cosy eateries along the road where you can indulge in incredible local foods including homemade cheeses, fresh meat and fish dishes, and authentic reindling, a kind of cake/bread hybrid swirled with cinnamon. The road goes from Innerkrems to Ebene Reichenau and costs €19 per car for a day. Running from Lanslebourg-Mont-Cenis in France to Susa in Italy, the Col du Mont Cenis is another epic drive through the Alps that's a favourite amongst cyclists as well as driving enthusiasts (it has featured in both the Tour de France and Giro d'Italia bicycle races). Looking further back in time, this pass also has a really interesting history as a well-trodden path between France and Italy, so your drive will take you on a historic as well as scenic journey through the Alps. To name just a few of its historical milestones, it's thought to have been a possible route of Hannibal's famed crossing of the Alps in 218 BC, the site of the Army of the Alps victory in 1794, and Napoleon is said to have built a proper road over the pass in the early 1800s. Starting the drive from the French side, you'll begin to climb up the pass amongst towering pine trees with spectacular views into the valley. 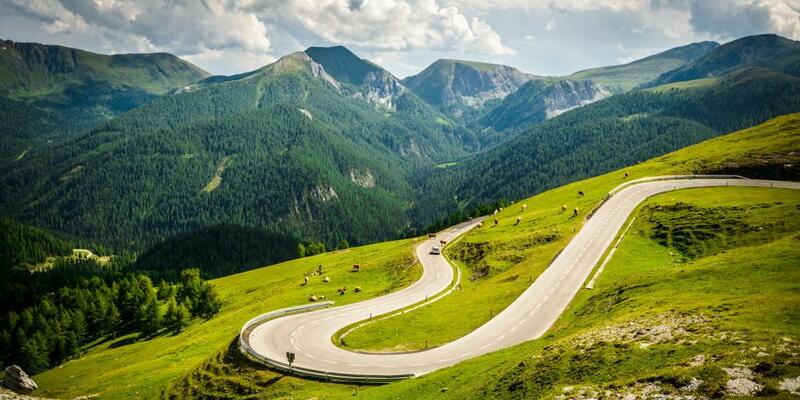 You'll arrive at the famous five hairpin bends pretty much as soon as you set off, making this a quintessentially Alpine drive from the get go. 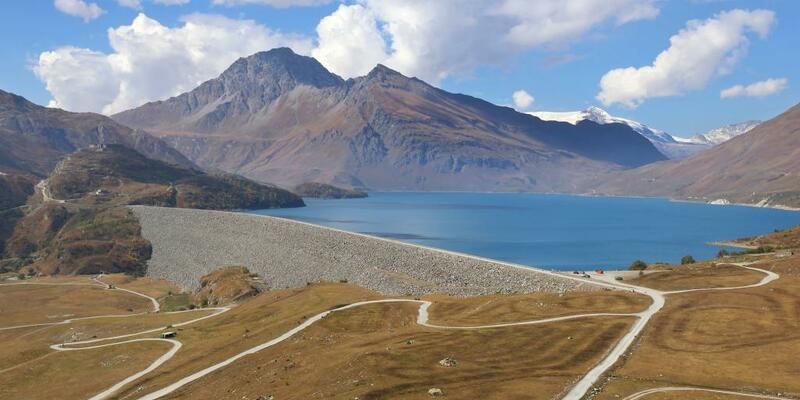 Once you get to the top, you'll be met by the vast Mont Cenis Lake (Lac Mont Cenis), a glittering blue artificial lake created by the nearby hydro-electric dam. This may at first sound like an eyesore, but if we hadn't told you, you wouldn't be able to tell the lake was man-made as it blends in seamlessly with the surrounding grassy plains and mountains. From here, descending the Italian side of the pass is a whole other experience, with fewer sharp turns, narrower roads and lusher vegetation all welcoming you to Italy..
We're rounding out our list of the best drives through the Alps with a bit of an unsung hero. Let's be honest - Slovenia isn't the first country that springs to mind when you think of the Alps, with the epic roads and popular ski resorts of France, Switzerland and Austria often stealing the limelight. But there are some incredible features of Slovenia's Julian Alps that we think deserve just as much attention, one of those being the Vršič Pass, the highest road in Slovenia. 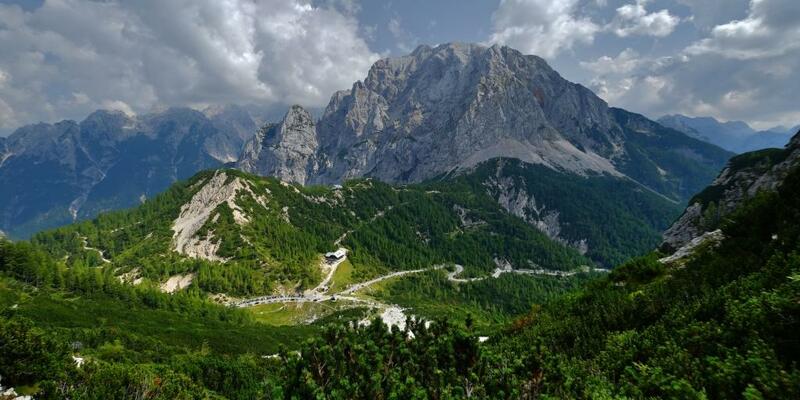 Starting in Kranjska Gora, the road climbs 1,611 metres and zig-zags around 50 hairpin bends before heading along the top of the pass and descending into the beautiful Soča Valley. The history of this road is less than cheerful but very prominent as you drive through. The road was built in 1916 using Russian prisoners of war as forced labour, approximately 300 of whom were tragically killed in an avalanche that buried one of their prison camps. Today you can visit a small chapel built to remember the casualties at hairpin eight, and the road was recently renamed Ruska Cesta (Russian Road) to honour those that built the road as well as the lives that were lost. On top of paying homage to the road's history, you can enjoy the dramatic mountain vistas, pull over for a picnic beside the impossibly blue Isonzo river, and take your time meandering around the many bends. It may only take just over an hour to drive, but you'll want to spend at least two or three marvelling at this lesser-known corner of the Alps.